I've been wanting to write something about Frederick Myers and his Mercury typewriter for a few weeks now, and today I get another opportunity to do so. The last time I approached the subject I baulked at it because the only decent image of the Mercury available is on Richard Polt’s The Classic Typewriter Page, accompanying a story about the Mercury. It can be found here. Doing this “On This Day in Typewriter History” series is a tough enough gig, but I rely heavily for help from my typewriter collecting friends across the globe and if I didn’t get the generous assistance and encouragement from people like Richard Polt, Alan Seaver, Will Davis, Peter Weil, Martin Howard, Flavio Mantelli, Paul Robert, Richard Milton, Georg Sommeregger, Herman Price, Anthony Casillo, Wim Van Rompuy, Markus Elster, Chuck Dilts, Darryl Rehr, Tom Russo, Adwoa Bagalini and so many other kind people, it would be absolutely impossible. Still, I try very hard not to outstay my welcome and to be more self-reliant for images, without which these posts would look very dull indeed. So I have outlaid quite a few dollars to ship in from Germany Friedrich Müller's Schreibmaschinen und Schriften-Vervielfältigung and Ernst Martin's Die Schreibmaschine und ihre Entwicklungsgeschichte, to give myself a few more options. I might not be able to read the text, but I’ll have fun looking at the illustrations! Also, new-found access to back issues of Typewriter Topics will help enormously, too. Frederick Myers was not, as some typewriter histories would have us believe, an Englishman. 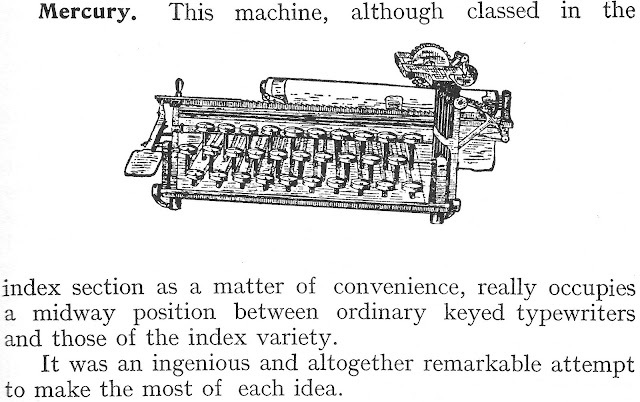 At the time of applying for eight of his nine typewriter patents in 1890-91, he was based in Liverpool in England but was a United States citizen. He applied for the ninth in New York. Myers was born to Frederick and Judah Myers in Baltimore in 1841. He was a mariner and first travelled to Liverpool as a boatswain on the Annapolis in 1871. Myers settled in Preston, Lancashire, with his family and started a grocery store, but in 1874 went bankrupt, owing many creditors. It took a while for him to work his way out of that setback, but Myers seems to have had marginally more success with typewriter inventing. 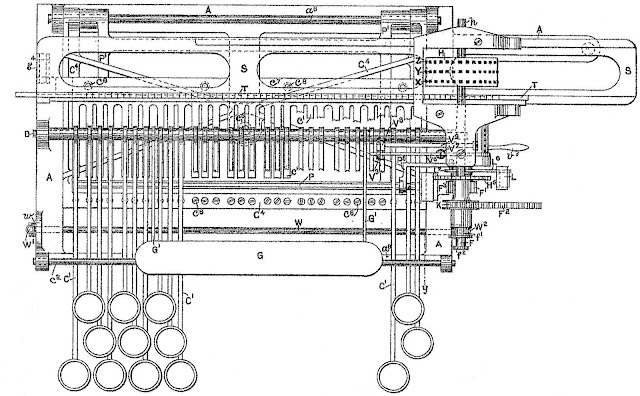 In 1886-87 Myers designed two machines, one with typebars in two semi-circles hanging over the platen, the keys being attached directly to the bars. The other had a conventional keyboard (though Myers took the “Q” from the top left to the bottom right) with a very large typewheel. Myers patented both throughout Europe and in the US. They were both assigned to the Mercury Type Writing Machine Company of London. In 1889 Myers came up with the machine we know as the Mercury, yet this patent was unassigned. An improved design for this was patented on this day (December 2) in 1890 and was also unassigned. Myers continued to work on this design yet in 1891 persisted with the large typewheel idea for Mercury. Eventually he reverted to something like the Mercury typewriter, and to QWERTY. No sane man would be able to make head nor tail of Myers’ designs, yet toward the end of the 19th century the Mercury was somehow made and marketed. It sold for eight guineas, weighed only 8lb and measured 7½ inches square by 4 inches high. Myers returned to the US in 1894 and for the next 30 years concentrated his inventing efforts on the like of phonographs and pneumatic tires. During that time he established both the Myers Manufacturing Company in New York and the Myers Phonograph Corporation. He also designed for Stylophone. Thanks for shedding some more light on this invention and its creator. I have faith that someday, a Mercury will come out of some British basement. I will add a link to your page from mine.